Blustery, widespread northeast winds will buffet East San Diego County on Monday. A National Weather Service wind advisory for the valleys and mountains will be in effect until 10 a.m. Tuesday. Winds of 15 to 25 miles per hour and gusts of up to 50 mph are expected in the valleys. The winds will be stronger in the mountains, 20 to 30 mph with gusts of 45 to 55 mph, according to the NWS. “Surface high pressure over the Great Basin will bring periods of gusty northeast winds near and below the coastal slopes of the mountains and below mountain passes and canyons into Tuesday morning,” according to the weather service. Forecasters warned that the strong winds may making driving difficult, especially for motorists in high-profile vehicles. 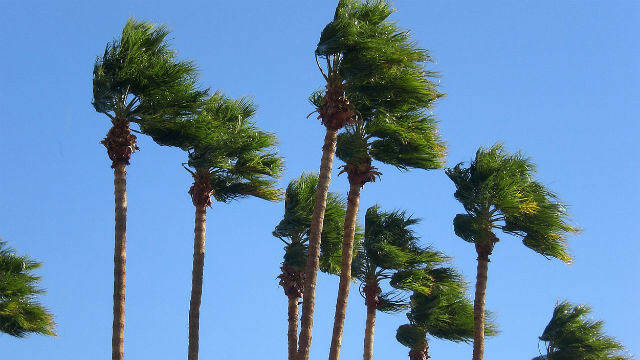 “The winds should remain mostly at a nuisance level, with localized gusts in the 40-50 mph range bringing cross winds to a few local highways/interstates,” according to the weather service.